Could SpaceX mini-sub serve as space escape pod? The mini-submarine created by SpaceX engineers may not play a role in the crisis it was designed for — the Thai cave rescue drama that’s now speeding to a resolution — but it could be a lifesaver for future space missions. “With some mods, this could also work as an escape pod in space,” SpaceX’s billionaire CEO, Elon Musk, said today in a series of tweets sharing the team’s progress. Last week, Musk’s Twitter followers asked him what he could do to help the team in Thailand that’s working to extract 12 young soccer players and their coach from a flooded cave. After considering a “bouncy castle” air tube that the kids might be able to wriggle through to safety, Musk and his team settled on the idea of building a kid-sized submarine, equipped with external air tanks. A foot-wide liquid oxygen transfer tube, originally built for SpaceX’s Falcon 9 rocket, would serve as the hull. 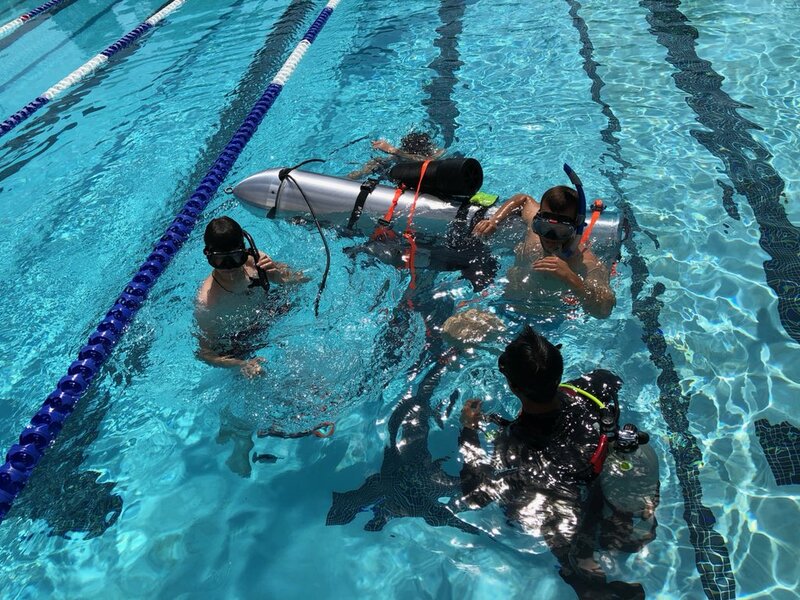 The contraption went through dive-pool tests at Palisades Charter High School in Los Angeles and was sent on a 17-hour flight to Thailand. Meanwhile, the rescue team at the Tham Luang cave complex decided that the situation was too dire to wait any longer. Over the weekend, a team of expert divers began escorting the kids out of the cave. At times, the boys had to be hooked up with full-face oxygen masks as they swam through water filling the narrow, pitch-black cave channels. The crisis could be resolved without having to resort to SpaceX’s mini-sub, and without further fatalities, which everyone agrees would be good news. But in today’s tweets, Musk made clear that he wouldn’t consider the effort wasted even if it doesn’t come into play in the flooded Thai cave. The concept could come in handy for future underwater rescues on Earth, or rescues in the vacuum of space. In any case, it’s instructive to see how the crowdsourced engineering exercise unfolded over the course of just a couple of days. That’s why we’re passing along this long string of tweets documenting the creation and testing of the mini-sub. Get all the tweets on GeekWire. This entry was posted in GeekWire and tagged Elon Musk, Space, SpaceX, Technology, Thailand. Bookmark the permalink.